There Will Be Blood, Children of Men, The Dark Knight, City of God, Memento, Eternal Sunshine, Requiem for a Dream, Into the Wild, Amores Perros, and possibly some others are missing for the 00’s. i still haven’t seen mad men, but i’ll have to add it to our netflix list. what about slumdog millionaire? 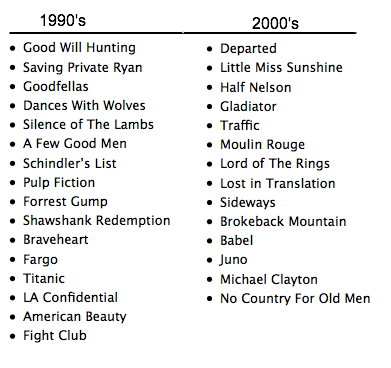 i don’t know about best, but i’d definitely put it way, way above little miss sunshine or gladiator. Granted my point of view is entirely tainted, but I think animation deserves an aught nod… particularly to Pixar. After a void in great feature animation in the late nineties (minus Toy Story), Pixar stepped up and filled it with some truly memorable movies that I believe will withstand the test of time much better than many of the live action … Read Morefeatures on this list. Sure they aren’t as “serious” or “heavy” as most of these listed, but who made the rule that a feature has to be dark or some sort of mind-f@%& to be among the best? They don’t need to be self-important. Animated movies with great characters and stories are pure escapism – which are what movies are ultimately meant to be. And Pixar’s got it, knocking out emotionally engaging, yet universally accessible flicks: Nemo, Incredibles, and even their latest… Up (which is definitely not lacking in “heavy” moments). The greatest fantasy film of all time. The greatest dual plot line of all time. Artistic and entertaining a winning combination. A revelation in a medium. Beautiful and original. The most important piece of animation since Walt Disney started work.